Organic fermented soybeans in an easy-to-drink nutritious beverage. Made with real USDA certified Organic Soybeans. Directions: shake well before use. Take 4 fl oz (118ml) before meals. The benefits of fermented soy in one easy-to-drink nutritious beverage. Made with real USDA certified Organic Soybeans. A convenient daily serving is great for Nutritional Support. 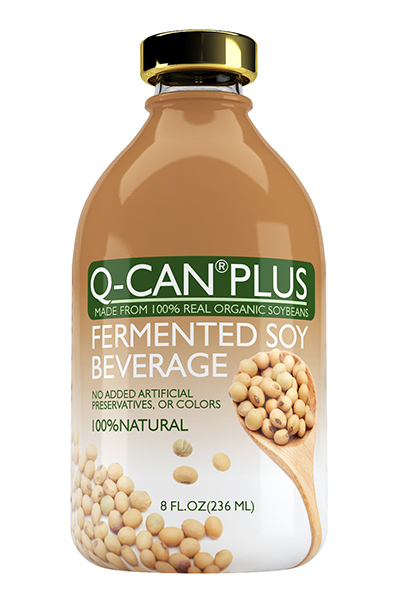 Q-CAN® Plus is a unique formula derived from advanced fermentation techniques. The fermentation process breaks down beneficial soybean nutrients into a nutritious beverage and a part of a balanced diet. Rich in amino acids, trace elements, and branched-chain fatty acids. Q-CAN® Plus offers a wide-ranging nutrient diversity than traditional soy products including a larger percent of bioavailable isoflavones including Genistein and Daidzein. Suggested Use: Use as a part of a balanced diet. Keep in cool and dry environment. Keep out the reach of children.